Thank goodness it's Leap Day! I wouldn't have been able to post my once a month Blog if it wasn't. This month I'd like to show you some of the beautiful places I've visited. As you know, traveling is a big passion of mine. Funny thing is, if I hadn't come here to Japan after graduating college, I may have never picked up the bug, the "Travel Bug" that is. Japan was the first foreign country I visited (Tijuana, Mexico doesn't count). And now I've been to 35 countries, but who's counting? I guess I am, haha! Each journey leaves a lasting image in my mind. With every country, there's a story, a memory, a friend that was made or an adventure that was had. I've been very fortunate; for every 99 good things that I've encountered in my travels, I've only had to deal with 1 bad thing. Even the bad things weren't so bad. I think of them as learning experiences. For example, there was the time I was duped into playing the "Pick a card" scam on La Rambla in Barcelona. The whole crowd was in on it and I was taken for about $75 bucks. I also almost had my backpack stolen while I was on the payphone inside the busy train station in Paris. Luckily, I was too fast for them, hehe. And then there was the time I had to go to the bathroom but...I don't think I'll finish this one. And the good things that have happened, there are just too many to tell. So let me just show & tell you about 10 of the beautiful places I've visited. I'll start with the Pyramids in Giza. By far, these were the most breath-taking sights I've ever laid my eyes on. To be able to touch these structures that were made more than 2000 years ago was just an incredible feeling. 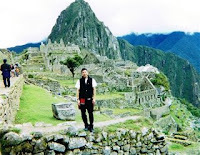 Machu Picchu, often referred to as "The Lost City of the Incas", is 7875 feet (2400 meters) above sea level. Angkor Wat, the awe-inspiring temple was built in the 12th century. Forbidden City was the Chinese imperial palace. Sagrada Familia is a massive Roman Catholic church designed by Antoni Gaudi. Construction began in 1882 and continues even now. Cappadocia is a region in Turkey characterized by natural wonders often resembling fairy chimneys. Christ the Redeemer (statue) is 130 feet (40 meters) tall. It's a statue of Jesus Christ in Rio de Janeiro. Stonehenge is one of the most famous prehistoric sites in the world. It's believed to have been erected around 2200 BC. Venice, world-famous for its canals, is connected by about 400 bridges. The Eiffel Tower, one of the most recognized structures in the world, was completed in 1889. My travels are not done; there will always be someplace I want to go. Seeing different cultures first-hand makes me more interested in learning more about our world. It's also let me see my own country in a different, more objective light. To my friends back in California who haven't come to visit me here (and that's most of you), come out and see a different part of the world. You won't be disappointed. :) Happy travels everyone! I am shoco. I have met you in the days of a student in Okayama. Do you remember it? I got a postcard from you (who?) were in Hawaii. I am sorry to never answer. I found your blog yesterday. It was great discovery!! You never change to pass more than 15 years.You have the really wonderful life. I respect it as a friend. Is not there the person doing an English class (of?with?) your friend in Okinawa? I live life that I never mention English.I should have learned more English from you for school days. Please try work hard. I come for your blog again. I can remember knowing someone with your name back when I lived in Okayama but unfortunately I can't picture your face. I am very happy that you remember me. It's great that you still have an interest in English. It's never too late to be a good communicator of the language. I'll look for you again on my Blog. I am Mariko. I am surprised that you have visited many many countries!! I want to visit and see wonderful things, too. Example, Venice. I will come your blog again! Are you thinking to visit Saudi Arabia some day ?